Please note you don't have to use a softphone in order to use our VoIP service. You can use "Webcall", "ANI callback" or "SMS callback" without any software. Press "menu"==>"Settings" and select "Line 1" under "SIP Account". 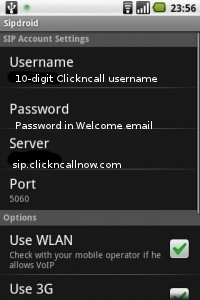 Enter your 10-digit ClicknCall user name under "Authorization Username" or "Username". Enter the password as shown in the original welcome email you received from ClicknCall. Tick "Use WLAN" and "USE 3G".